How the Mass. 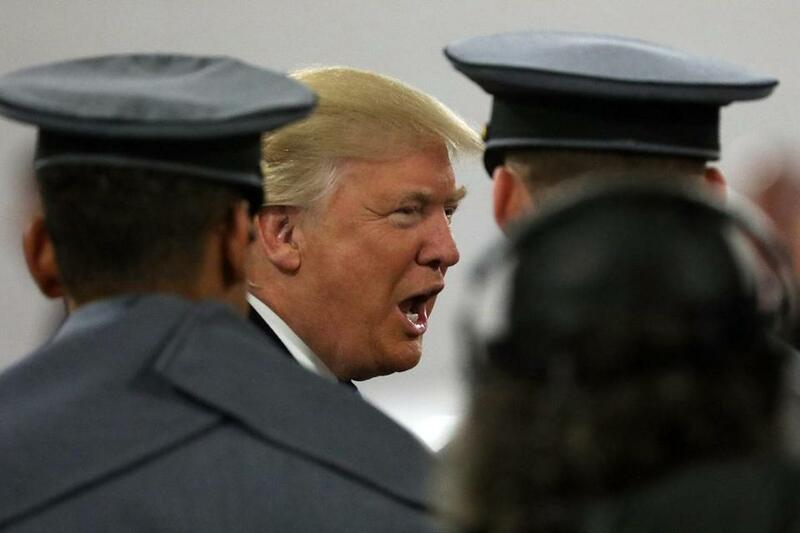 economy overtook Conn.
President-elect Donald Trump met with cadets from the military academies prior to the Army-Navy game on Saturday. Connecticut is in a rut. For decades it was the unrivaled economic powerhouse of New England, leveraging its proximity to Manhattan to woo global companies and attract high-paying jobs. But no longer. Massachusetts last year leapfrogged Connecticut and secured its place as the regional dynamo, with the best wages, fastest growth, and a mix of industries better suited to success in the 21st century. General Electric Co.’s decision to decamp to Boston may be the most visible reflection of this broader shift, but Connecticut’s economic woes run deeper than any one company. On most every front, the state is still struggling to escape the damage of the Great Recession. Unemployment is 5.1 percent, higher than the US average, and despite having some of the toniest suburbs, its housing market is among the weakest in the country. A much-needed boost may be coming, in the form of Donald Trump, whose pledge to cut corporate taxes and reduce regulation could mean a flood of new money for Connecticut’s oversize finance sector. But even that would be a temporary balm, leaving the state vulnerable to future financial crises and short the resilience it needs to build a sustainable economic future. As falls from grace go, Connecticut’s has been rather sudden. Ten years ago, it was the undisputed economic king of New England, with average incomes 13 percent higher than Massachusetts and 40 percent above third-ranked New Hampshire. And this heady success wasn’t limited to hedge fund billionaires in Greenwich. Throughout the 1990s and 2000s, low- and middle-wage workers in Connecticut consistently took home bigger paychecks than their Massachusetts peers. In the past few years all these economic advantages have disappeared. Unemployment is now far lower in Massachusetts. And Bay State employees get the best wages — whether you look at low-earners, top-earners, or those in the middle. Perhaps the most dramatic sign of Connecticut’s collapse is its flagging housing market. Consider this dismal statistic: Of all the cities tracked by the National Association of Realtors, 90 percent have seen their housing prices rise since 2010. That leaves just 17 metropolitan areas still trying to claw back from the recession. Four of those underwater markets are in Connecticut — and they extend to virtually every corner of the state, from Stamford in the southwest to New London in the east and as far north as Hartford. Why is Connecticut struggling so mightily? There’s no single culprit, and no quick fix. But one key issue is that Connecticut hasn’t yet adapted to the demands of a modern economy. Since 2000, this sector output has grown by nearly 50 percent in Massachusetts, which has helped make up for the ongoing decline in manufacturing jobs and given the state a reliable engine for 21st-century growth. In Connecticut, these same fields have expanded output by just 6 percent. And that’s not because the state has concentrated on other high-skill industries. Instead, the biggest changes in the Connecticut economy have come in less productive sectors that add little value, such as wholesale trade. Unlike Massachusetts, which has built a thriving economy around high-skill sectors like life sciences, Connecticut hasn’t found a durable formula for post-industrial success. The question is why? Why have these two neighbors taken such different paths? State policy could well be a factor, given the active role Massachusetts lawmakers played in nurturing the life sciences. And you never want to discount the role of mere chance in the evolution of economies. But Connecticut also has a natural disadvantage. It lacks a major city like Boston, with its mix of educational institutions and downtown businesses, pure research and market-facing companies, students and startups. These sorts of serendipitous connections have helped make Boston a nexus of economic energy in an era when cities are attracting new residents and driving economic growth all over the country. Greater New Haven, with Yale University at its center, has around 850,000 people, compared with the nearly 5 million residents that the Census Bureau counts in Greater Boston. Connecticut is a reliably blue state that voted overwhelmingly for Hillary Clinton. Nevertheless, it has a lot to gain from a Trump administration, especially if Trump succeeds in his push for financial deregulation and big corporate tax cuts. Finance represents an unusually large part of the Connecticut economy, not just in terms of jobs-in-state but also because of commuters who make their living on Wall Street but spend their money in Connecticut communities. For that reason, a Trump-fueled surge in corporate profits and stock valuations could provide a much-needed boost to the state’s fortunes. But if there’s one lesson of recent years, it’s that counting on Wall Street excess to compensate for other economic ills is a dangerous strategy; bubbles burst, recessions happen, and in the absence of a long-term economic strategy, Connecticut could once again find itself floundering. What the state could really use is a boost of native entrepreneurship and diminished reliance on runoff from Manhattan. But this isn’t easy to accomplish. Without a hub like Boston, Connecticut can’t simply pull pages from the Massachusetts playbook. Before nutmeggers succumb to despair, here’s one hopeful prospect. It could be that Connecticut’s brightest future looks a lot like its 1960s past, when it sprang to life as a suburban oasis. It’s no secret that today’s young people have been struggling to escape student debt and find a path to homeownership. But they should get there eventually. And with the right investments in schools, transit, and local services, Connecticut could reposition itself as the natural choice for young families ready to leave the gritty city and try life in the suburbs — especially if housing prices continue to fall. That’s not the only path forward, but one way or another it seems like the state could use a more far-reaching plan. Right now, all trends are pointing in the wrong direction.